We just pulled up sales numbers for Lee County for July 2010 and we see a trend continuing that began about 4 months ago in many areas. Except for Cape Coral, the percentage of sales that are distressed is rising throughout the county. 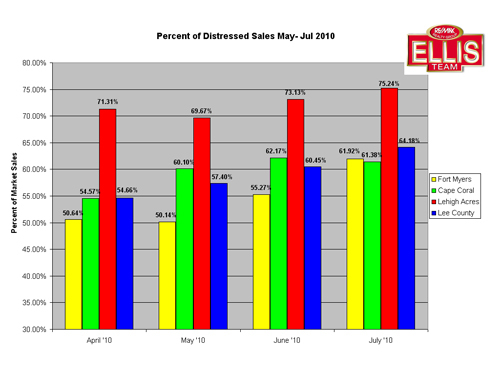 Cape Coral has remained relatively steady at about 62% of all single family home sales the last few months, but even that is up from 54.57% in April. Lehigh Acres is leading the county by far with approximately 3 out of every 4 sales being in distress. This number has risen from 71.31% back in April. Lee County numbers have risen about 10% in the last 4 months, which is an interesting sign. Is this troubling? Foreclosure sales are going down, as are short sales, but regular sales are falling even faster, which leads to a higher distressed sale percentage. To that extent, this is troubling. Some would argue that more short sales going through is a good thing, and it would be if this were true, but short sales have been going down in recent months. Banks have not been easier to work with on short sales overall, while in some select instances they have been. Foreclosure sales have fallen as a backlog has been slow to enter the market. We’ve been told there are still many homes in backlog, while some dispute that fact. We’re also noticing new foreclosure proceedings starting on failed short sales and people who’ve managed to hold off this long but no longer can due to employment and the economy. Heading into the fall elections, it’s safe to say things are not better with the economy, and the housing market is not finished cleansing itself. The good news is we have a market, and the market is absorbing new bank foreclosure listings, but nothing is being done to help the economy and prevent them in the first place. Mortgage modifications have largely been a failure, and government efforts have been a joke. Back loading a mortgage modification with extra principal and interest to the back end of the loan doesn’t help the homeowner when given a 6 month reprieve on payments. At the end of 6 months, they still cannot afford the loan, and now the payment is higher than it was before when they couldn’t afford it. If a bank is willing to short sale to a new buyer, maybe they should consider a principal reduction to an existing owner who is in Real trouble. I know banks are afraid to do this as every homeowner would ask for the same thing regardless of need, and this is a valid concern. It is, however, probably one of the few tactics that would work. The other is to provide meaningful employment, and it’s clear that the stimulus plan hasn’t worked. The government has failed at both ends of the spectrum. All mortgage solutions have been voluntary on the banks part, and the banks haven’t always behaved nicely when dealing with distressed sales. It’s time for a plan with teeth to compel the banks to cooperate, and a plan to get the economy moving again. Housing plays a big part in the economy; approximately 32% of GDP, so it makes sense to kick start the economy on Main Street. Wall Street will respond once Main Street is stabilized. November is only 3 months away, and I have a feeling the voters are going to vote with their pocket books this year, or perhaps with their pink slip. Posted in Southwest Florida Real Estate, SW Florida Bank Foreclosures.Tagged bank foreclosures SW Florida, Cape Coral home sales, Lee County Florida housing market, Lehigh Acres foreclosures.